It’s a double whammy today! 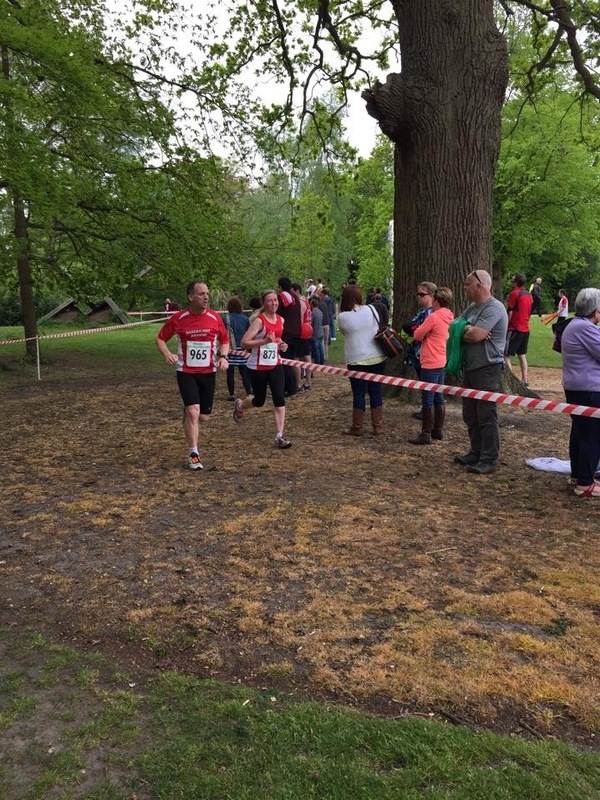 Race report from Bracknell half mara from the lovely Royston and a bit of an insight from Tim. I’m just going to let them both get on with it as they tell the story better than I can! In other news we have reached 100 followers on Twitter! Apparently this should mean something good – but as twitter is pretty much lost on me I’ll just say “yay go us!” and move swiftly on…. I’ve started with Tim’s review of the event and finished with Royston’s report. For those of you that don’t know Tim he can be found running on a Tuesday or Wednesday and can be easily spotted as the guy running pretty quickly whilst happily chatting like he’s at a strolling pace! Oh and you should all hopefully know who Royston is by now! I always find it a nice friendly event that isn’t too big being limited to 1000 runners. The organisation is really good and having the start and finish at South Hill Park is a nice touch. 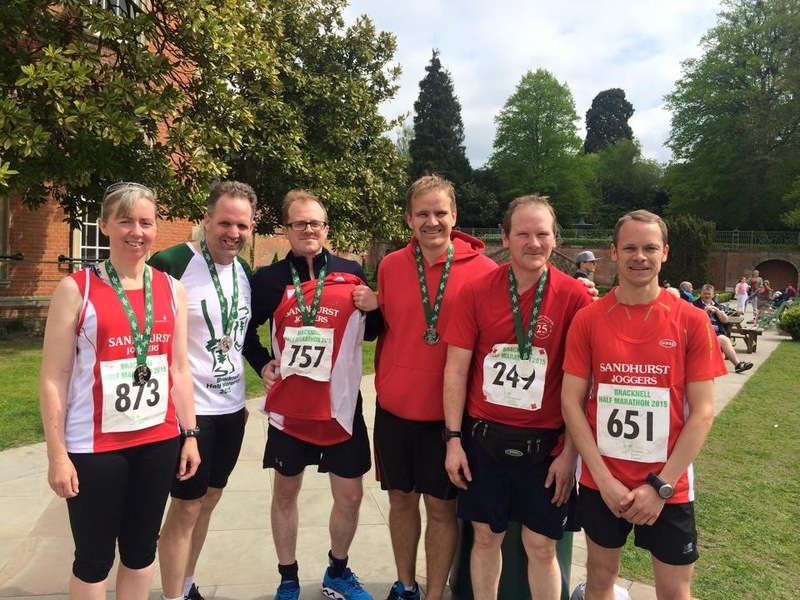 The half marathon route is a bit different from the usual following mostly footpaths and cycle ways through the housing estates of Bracknell where there are plenty of residents offering cheers of support and jelly babies! The second half of the route is a little more undulating, but keeps you interested and challenged! The marshalls were all fantastic and always cheered us on too. Bracknell was my first ever journey into the realm of half marathons, aged 21, so that’s an incredible 24 years ago, I know you could never tell, but honestly it was. This was home, somewhere I’d grown to love and hate in one go, desperate to leave, always happy to come back. That year I ran 2:10, and I remember It was just as hilly back then, harvest ride was still in the planning stages but that didn’t stop them finding some evil little inclines to test your legs out towards the end. Roll on 24 years and it still has that feeling of home, even though It’s been a good few years since I lived there. I had arranged to run with Jackie Kent on this occasion, so was looking forward to some company on the trip down memory lane. We had decided on a target time of 1:45, not a problem we thought, oh we had a shock coming. Expecting a gun to go or a more assertive GO!, the local mayor made a mild ready steady go, and we slowly moved away. The sun was beating down and the temperature was slowly rising meaning it was going to be a warm one, my first warm one this year as spring brings some pre-summer sun. First couple of miles we are bang on target, 7:45, but I’m not feeling it, “ok” I thought, “keep with it, relax and find the zone”. Jackie is looking relaxed and we start to catch a few of our SJ friends as we enter Wildridings, this is where we start hitting the first of the hills, not huge but enough to test the legs, the only thing that takes my mind off the tired legs is this is home, this is where I got into mischief, played knock down ginger and chased the girls, this is one reason I run Bracknell. As we depart Wildridings we head into Mill pond, a man made pond that dates back to the early seventies, I start to feel, well, sick, not enjoying this, the pace is quick and my legs are now reminding me that it’s only been two weeks since I travelled round London. Entering Jocks lane, I watched as Jackie slowly departed into the distance, and the only thing on my mind was what’s round the corner. We start the slow climb along harvest ride (Paul Alexander, forgive me, the hill starts at six miles and continues ) he’ll forgive me one day. London has caught up with me well and truly, the hill is taking it’s toll and I can just glimpse Jackie, the aim of the game now is just keep moving forward and stay under nine minute miling, A boost to the system, seeing the legend that is Smiffy and his peloton of Madeleine, ok not quite a peloton, but certainly a welcome shout out, shame the legs didn’t hear them. I know what It must feel like to climb Everest, as I near the summit of Harvest ride and round the corner for the last short sharp climb, then it’s down hill and onwards, this was pure endurance now, survival, grin and bear it. As I head up into Harmanswater, another smaller hill, similar to Ben Nevis, I’m some how finding the willpower to turn the legs over and just focus on the ten mile mark as then It’s just a Parkrun to go, oh famous last words. A welcome sight, Matt and Kerstin are stood on the side at around 11 miles shouting encouragement, then the familiar sight of Mike Gascoigne in his London finishers shirt, yep the legs spotted that T shirt and started to whine again, push on just push on. I was really hoping to finish sub 1:50, so a quick calculation and I figure if I can run 24 minutes for that Parkrun I’m home just under, this encourages the legs to turn over a tad quicker, yeah it hurts. The great thing about Bracknell is you’re guaranteed to find smile from a familiar face, and as I head towards the Hilton, I see Sasha, with that encouraging look, whilst she tends to an injured runner, a quick glance down to see if it’s serious and I trundle on, with a quick wave. I had not expected to see Jackie again, until I have stumbled over the finish line, so imagine my surprise to see her as she takes on some water at the final water station, She had discovered that wall, the dreaded wall.” I set off too fast”, she tells me. We head in the final mile and half together, urging each other on with a possible sub 1:50, oh and it hurt. 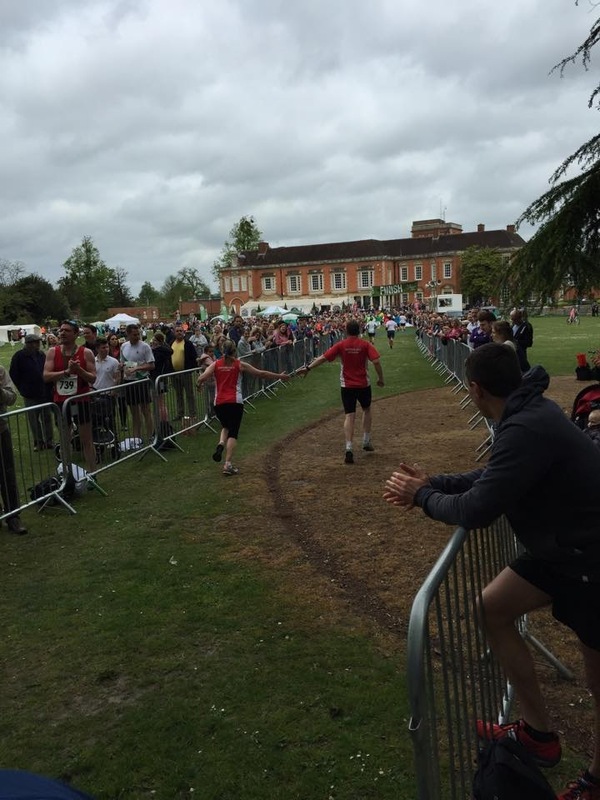 We enter the grounds of the Historic South Hill Park to the encouragement of our SJ friends, casting my mind back to London and the fact the first ever finishers crossed the line #handinhand, I reached across, thinking we started together, we finish together, just don’t mention the bit in the middle. Running is not just about cracking PB’s or hitting targets, but supporting each other as the going gets that little bit tougher, oh and of course, reminding yourself that London was only two weeks ago. So that was my trip through Bracknell and another trip down memory lane. Thanks to you both and well done to everyone who took part – sounds great if you love a couple of killer hills! The low down on the Greenbelt Relay is coming up in the next few days!